A pretty gorgeous asymmetrical hemline beach dress has amazing geometrical print with beautiful color combination. 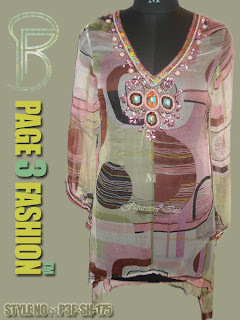 It has V shape neckline and long sleeves with hand embroidery of fine quality beads and sequins. It has fabulous luxurious look for any beach and resort. •	This beach dress has amazing geometrical print and embroidery to enhance wearer’s look on any beach and resort. •	Comfortable, stylish and feminine. •	An ideal beach dress for any resort and beach.